Heidi Väätänen is a Finnish writer and dramaturgue. 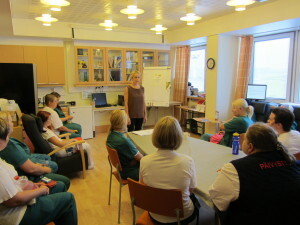 She attended the Finnish version of LFEO for nurses at the Emergency Department at the University Central Hospital Helsinki. Before the lecture I am thinking of my last visits to hospital: a friend just after the delivery. A dental check-up. My father after his heart surgery. Anonymous corridors and the smell of the ward. The moments I do not think back but forget as I step out through the electric door of the hospital. But no long-term departments. Treatment periods lasting weeks and months. I knock on wood. I doubt that I would have these thoughts if I would be on my way to see a performance in a conventional theatre space. But I am not as the performance takes place in the highest building of the Helsinki University Hospital. A shift in the consciousness and thinking – one very good reason to take performances out of the theatres. Lecture For Every One. A lecture written by Sarah Vanhee for every one and all of us. A lecture given in different countries and places: private companies, hospitals, meeting rooms. And this time: the green-painted walls of the hospital. An attempt by the designers to avoid total sterility and coldness. No smell of urine. The air conditioning is somewhat better than last time. I walk down the stairs with the producer and performer to the heart monitoring unit. This time I am not going to visit my father but to see Lecture For Every One, an internationally known work of contemporary art. We take the production photo on the corridor couch. An empty wheel chair comes to the picture. A patient in a bed is passing us. No hurry or soundscape familiar form the television series, only a fragile and shrunken human being between the hospital sheets. Waiting room. Taking of the specimen. Examination room. Heart monitoring. Waiting number 27. We are not waiting for our turn for heart monitoring but to a performance. A childish and old fashioned divide between the art world and the rest of the world is getting bigger. We walk towards the performance space, a rest room for nurses and secretaries from which we hear an ongoing lively discussion. This moment is interrupted by a contemporary performance intervention – Elina Pirinen acting as a lecturer stands up by the table. A group of the nurses sits at the table, the rest on chairs along the walls. I stand behind everybody else close to the door. The placing and my posture underline my sense of being an outsider. I am not the one who the lecture is given to but the one who is observing the ones who are lectured. They – we – on old story form the sociology books – I become aware of my role as an observer and I find it difficult to watch the people. The blue eyes of the performer are constantly refocusing on different listeners. People are focusing on their laps. Diagonally up. On the lecturer. The performer is lecturing about different kinds of faces and bodies, tired and unknown. The bareness of the words and the literature transform the moment – the mundane drinking of water from the bottles is interrupted. I find it hard to evaluate if the ambience is exalted or ill at ease. People are holding paper cups and water bottles in their hands. Someone is fanning her face. Other one is stretching her neck. A Windows logo is turning on a screensaver. These are some details that I remember afterwards. I am not sure how to read them. Are the people ill at ease or am I projecting my own discomfort as an observer of the situation to them? Is it about my own respect towards people doing “real work”? Would it be easier for me to receive the lecture in a more neutral theatre space? Do I feel that a theatre would provide the performance with the protection it needs, and would it make visible performativity of the performance? Now the social context, university hospital, changes the performance situation (and the meanings of the text?) and highlights many ethical questions: how are we using these 17 minutes of shared time? Who is speaking and to whom and what? A lecture as a form of the performance determines the situation and frames it but as the content is dealing with ideas such as living together and in the end with very personal views on moral and ethics, I am not sure if the framing is sufficient. As the lecture form already includes a certain didactic and expertise, should the language and words be somehow differently arranged? The outspoken and open nakedness of the performer is beyond any doubt something important. An interruption. A rupture of everyday routines. The changing of a familiar way of being into something else: how often in this space is there talk about disastrous nature of human beings, about love as a concrete act, about living together and power? Particularly the fragmentary stories about the taxi driver and love are arresting. Here happens an interesting intertwining of the performance situation and the fictional text: does the lecturer speak about something that really happened to her? Does she reveal herself just like that? The public fragility of the performer makes me sensitive as a listener – it is also easier for me to listen to the more clearly political and moralizing content as something more personal and specific rather than as a sociological and given analysis of the structures. As an author this perception renews my enthusiasm regarding the possibilities of the performance situation and fictional text. Regardless of this I feel often ill at ease. This is particularly the case when the word “care” comes up. A universally human word and undoubtedly a very important one, yet to me there is something strange when it is spoken about to nurses who daily change diapers, distribute the medicines and wash the elderly people. Their work is often commented in the newspapers as making too fast rounds, but aren´t they also working under the strain of the cuts and structural intensifications? But maybe this is exactly the challenge made by the lecture: in spite of everything, always, again and again, failing – care! We are before! The smallest possible politics. Yet towards the end of the lecture I hear mostly big words about the system and catastrophic nature of humans. The other presumed and addressed by the text – is it possible to generalize it to everybody? I am aware that this a lecture, but is it possible to lecture on living together as a subject as it intrudes on every one´s personal ethics and moral values? I register myself thinking about the possibility of a political and social art without the structure of addressing from above: what kind of text makes it possible to appeal on the level of personal ethics? Should the lecturer stay more on the level of private perceptions and story based anecdotes – on the level of fictional personal matters- than to talk about the system, machine, grotesque nature of the culture of freedom and consumption. Or should she stick more honestly in political language? I like the manner in which the lecture contains different kinds of text materials, jumps from one type of text to another, and the performance becomes more associative and open to different readings. Still I wonder if in the relation of “sociological analysis” and personal anecdotes the emphasis should be put somehow differently? Now the register of the language shifts between the personal and the universal, between the revealing and the pointedly, and I am not sure of the ethos of lecture: does it respect the addressed other as a particular other or does it address the other as general, this I think cannot happen without some kind of loss of the particularity of the subjects. Lecture For Every One – is it even possible or something desirable? Perhaps I am stuck in the ethos of conventionality – a reason why “so many things remain unsaid”. Maybe we need more of “I do have something to say” attitude. Here and there one can hear stubborn, careless and singular voices. Gradually there will be more multiplicity. These are the things that I keep reflecting on as we walk out the rest room. They will start their evening shift. I open the macbook and reflect.